Day Therapy at the Hospice – supporting patients to help them deal with the physical, emotional and social impact of living with a life-limiting illness. Within the Day Therapy unit we provide access to a range of services aimed at enabling each individual to maximise their wellbeing and quality of life. Our Day Therapy service provides specialist palliative care for adults in Rossendale with a life limiting illness or a long term condition. We aim to provide a happy and sociable environment in which patients can relax in comfort with the support of the nursing staff and other patients going through similar experiences. Spending time with us provides a day away from the home environment and a chance to meet new friends. Lunch is provided, with a varied menu to choose from. You can spend the day doing as much or as little as you like. If you feel like a pamper session, we have a Jacuzzi bath, complementary therapies such as reflexology, aromatherapy massage or reiki. You can discuss with your therapist which treatment would suit you best. 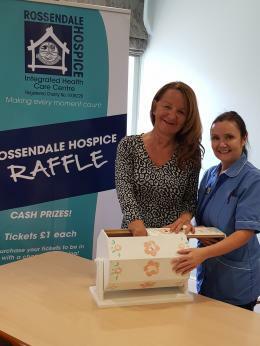 A hairdresser and manicurist visit the Hospice regularly. Our nursing staff can provide advice on symptom control, social support as well as arts and crafts sessions, quizzes, and trips out to places of interest, or simply to have fun! We recognise that caring for someone with a life limiting illness is stressful for both the patient and those caring for them so a day at the Hospice provides a much needed rest or simply time to catch up with everyday jobs.